My wife & I sold our house about two months ago. The idea was that we would downsize to a smaller house with more property. But during the interim between selling the old house & buying a new one, we were going to stay with family members. We expected it to be a matter of a few weeks, possibly a month or two. But right after we moved in with them, life jumped up and smacked us all. We had a few crises that have demonstrated to us that Murphy is alive and well, and apparently has taken a liking to our family. I won’t go into details, because those stories aren’t mine to tell. But a minor side effect has been that I haven’t been paying much attention to marketing for my writing, and to be perfectly honest, I don’t know when this is going to change. As a result, my numbers have slipped drastically, and I simply don’t have the time or setup to pursue the “traditional” marketing venues. So I’m going to try an experiment here. It may work, and it may not. I just figure this is the perfect opportunity to try something off the wall. My book with the worst numbers right now is “Streets of Payne”. I don’t know if it’s because the book is cyberpunk, and there simply isn’t the following for the genre that there once was, or if it’s because that’s my newest book, or if I’ve made a mistake with the cover, or blurb, or categorization, or what… All I know for sure is that the thing isn’t selling. So here’s my experiment. If you think you might be interested in a cyberpunk-ish techno-thriller, check out Streets of Payne. If it looks like something you might be interested in, buy it. I recently lowered the e-book price to $2.99, so it’s not like it’s going to break the bank. And for the first three people who purchase the novel in the next 24 hours, and can provide me with electronic proof of purchase, I will give you an Audible.com promo code for the free download of each of my three published works in audio format. 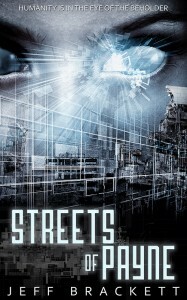 So, buy “Streets of Payne” in print or electronic format within the next 24 hours, email me (jlb DOT author AT gmail DOT com) with your proof of purchase, and I will send you promo codes for the free download of the Audible.com audio book versions of “Streets of Payne“, “Half Past Midnight“, and “The Road to Rejas“. I will do this for the first three people who contact me with proof of purchase before 10PM central time, Monday night. And then I’ll do it again for the NEXT 24 hours… and the next… until Friday night, or until I run out of codes, whichever comes first. Like I said, I don’t know if this little experiment will help, but I figure it probably can’t hurt, either. Right? :-? And that’s it for now. As always, stay safe. And no one replied last night. So I guess their loss is your gain, right? Check your email.